"This is a MUST race!!!" 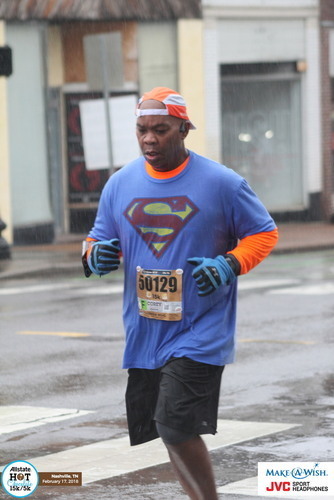 I loved everything about this race EXCEPT the weather (no one can control that). I opted for my packet to be mailed to me ($15 extra) so I didn't have to stay the night in Nashville and could just drive in for the race. I wish more races had this option. As bad as the weather kept getting (I was getting flash flood warnings on my phone while running) the volunteers were AMAZING!! They not only withstood that crazy weather, but they offered such amazing encouragement to the runners. Seriously, I can't say enough how enthusiastic and encouraging they were for us runners. I had been preparing for hills, o the inclines didn't really bother me, but if you are not used to inclines, I would train on a setting of at least, 5 on a treadmill and you will be fine. Weather and all, this was a wonderful race with AMAZING swag! !